I was lucky enough to be commissioned to do a project on premium beauty last month. This involved a field trip to Hanoi and Ho Chi Minh City (still colloquially known as Saigon). While analysing beauty archetypes and immersing myself in glamour magazines and visual culture I was struck by the creeping influence of an array of new beauty looks which play with mixed racial identity in an ambiguous way. This is a semiotic hedging strategy for a region which is becoming increasingly sure of itself and aware of its growing hegemony, whilst still vestigially in thrall to the West. Those who track such things know that the beauty archetypes have been becoming more Asian for years. In 2006/07 Shiseido launched Tsubaki in a lacquerware looking bottle touting the uniqueness of Japanese beauty. A brand called Ichimaki did the same thing. At the same time the Kao brand Asience released a cringeful and starring actress heavily insinuating the superiority of East Asian over European women. No longer are leggy blondes fawned over in quite the same way as they used to be; except perhaps in hostess bars! Far from seeking to be European, the pellucid, almost sepulchral North East Asian look seems to be favoured. Cosmetic surgery is booming and generally deployed to widen eyes, mitigate the epicanthic lid and lengthen the nose bone. Whilst this may have been originally motivated by a desire to emulate Westerners, this has been appropriated as an East Asian look in its own right.. This represents a paradigm shift from the round faced and fatter cheeked Vietnamese beauty of the 1980s and before. In Vietnam this is being driven by Korean (and to a lesser extent Japanese) visual culture with slick premium beauty brands such as Ohui, Lenarge and others. In this, Korean K-Pop, soft power and brands work hand in glove with one another. So, we have this general drift towards celebration of East Asian beauty. At the same time there is this penchant for mixed race models. I conducted a similar project in Japan 5 years ago and was struck by the popularity of so called ‘haafu’ (Eurasian half Japanese, half European models) even though they were still exotic and marginal curiosities it seems back then. In Japan the stigma of not being totally Japanese is gradually falling away. There are now famous ‘post race’ tarento such as Rora who are a Japanese, Russian, Bangladeshi mix. In Vietnam, a more conservative less ‘postmodern’ society, Anna Truong is a popular half Vietnamese, half German model and daughter of a famous singer noted for her warm and classy Eurasian beauty. Now what we see is the so called the Eurasian look being used alongside the more refined, more racially distinct and paler Korean look. So, if we consider some of the images chosen here we can see how this shift is playing itself out in practise. The Za cosmetics print ad features two models dressed as flower power exiles. They have the rosy pinkish complexion and broader cheekbones and the auburn highlights popular in East Asia but note their Amazonian stature and cosmopolitan aura. The ad perfectly captures the vanillarized ambiguity of these looks – impossible to pigeonhole, easy to accept. They paddle off a miscegenated atoll somewhere in the territorial waters of ‘Ocean Eurasia’ but refuse to be pinned down or reveal their definite co-ordinates. Occidental Caucasianness is becoming a twist or garnish to spice up looks, rather than adopted wholesale. This Lancome ad I saw outside a shopping mall in Saigon and in a fashion magazine is another significant cultural text. 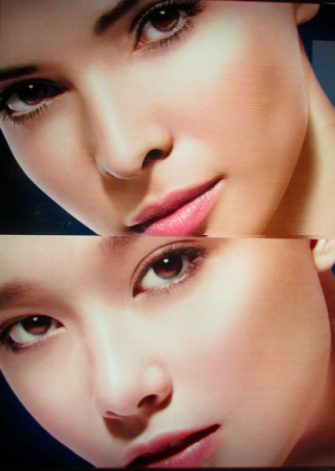 The two models adopt an identical gaze, as if the art director could not decide which to use. The double appeal of Caucasian and East Asian is the key here. This is also what all mixed race people have always known; we’re always ‘double’ in consciousness and heritage, never half. The beholder is meant to mix the identities in the mind like colour palette on an easel. An experiment by Gillian Rhodes a psychologist at the University of Western Australia in 2006 found that when Caucasian and Japanese subjects were shown photos of Caucasian, Japanese and Eurasian faces both groups rated the Eurasian faces as most attractive. A hypothesis from evolutionary psychology is that these faces are preferred because they signal genetic diversity, a vital marker of reproductive health..
As someone of Caribbean heritage who lived through the 1980s in the UK when being mixed race was not embraced in the quite the same way it is now, I am stunned at the ubiquity of mixed race models, particularly Caribbean/white mixed in UK advertising and on TV by mainstream brands like M&S. Miscegenation has become the darling of brand guardians who seem to think this ethnic daring boosts credibility with a progressive population, who may have their prejudices (and as we know from the muppet opera Avenue Q ‘Everyone’s a little bit racist’) but who want to believe in a world where exotic beauty trumps race. Of course the Obama phenomenon would have fed this trend. In East Asia the decision to use these models seems less political than strategic. From the semiotic perspective, this reveling in gradations is a sort of aesthetic rapprochement. The Eurasian look seems to square the circle, blending proud celebration of Asian skin with a dash of Caucasian exoticism. This also helps manage the tension between the desire for cultural capital and class mobility and the need to be anchored to an East Asian root. This cultural shift toward pluralized identity seems to have become pervasive in our current environment and not suprisingly, the West seems to be merging with the East in advertising as well as fashion, music, design, and spiritual practice. Similar to what Mikhail Bakhtin called ‘polyphony’–these concatenating voices are creating new signifying objects which do work on the consumer at the subconscious level (Lacan–the id that speaks) a space that’s undefined and unbeknownst to those immersed in a multicultural sphere. It’s like a new disjointed harmony which works through counterpoint: voices working to compliment different parts of the same melody. The semiotic hedging strategy which the author identifies may also be reminiscent of the financial hedging induced by competing market capital on the global stage. As advertisers have more precise tools at their disposal with which to manipulate facial and other characteristics digitally, these ‘appearingly’ subtle (but painstakingly calculated) shifts in signification are becoming increasingly invisible and undetected to the average consumer–who ignores the form and takes in pure content.